US defense organization DARPA has invented a fresh type of robotic prosthetic limb that it says can provide the wearer the feeling of touch yet again. Gratitude to a association directly into the brain, the paralyzed patient in query has been given back the capability to really sense objects around him. It's a considerable step onward for the technology and for prosthetics, enabling patients to not only pass down instructions to an synthetic limb but to essentially obtain several usual sensation back in revisit. Built in partnership with the Applied Physics Laboratory at John Hopkins University, the attachment has been tenderly called Luke. 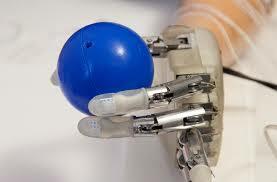 Its certified name is the DEKA Arm System. "We've completed the circuit," said DARPA plan executive Justin Sanchez "Prosthetic limbs that can be controlled by thoughts are showing great promise, but without feedback from signals travelling back to the brain it can be difficult to achieve the level of control needed to perform precise movements." The helper implicated in the testing, who has been paralyzed for further than a decade after a spinal cord wound, was capable to sense with almost 100 percent precision which of his robotic fingers were being touched by researchers. More trials are probable in the near prospect.